If I counted correctly, we have 35 more school days! Today is our last day of April break and when we return to school on Monday, the time is going to fly!! Now, if only it would warm up! Yesterday I saw a little girl running around the playground in shorts with her down winter jacket on as well! That's spring in Maine for sure! Today is looking to be a nice day. Blue skies. The wind isn't super crazy like yesterday. I saw on the news we had gusts up to 43 mph. And trust me, it felt like it when I was running! And it might get up to the 60s. I'm hoping this is it! It's no secret. I love Spandits. I especially love to have Spandits sightings when I'm out running. Yesterday, I had a Spandits sighting on the Rail Trail. I wanted to stop her and take photos of our Spandits...but thought she would think I was a little odd. The funny thing about it is that I went to high school with her! But, now I'm getting my family to wear Spandits. 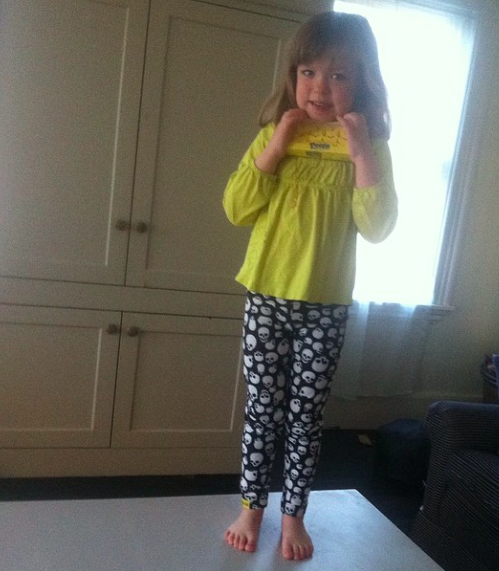 The Easter bunny brought Izzy some new Rumple Skullskins. Probably not what other people picture for an Easter gift, but she loved it!!! I have been loving my newest Spandits - Spirograph. But I'm thinking I need to get some pink Skechers GoRun Ultras now. ALSO a favorite of mine! I LOVE Skechers! It would definitely make my outfit complete. Wouldn't you agree? I've only eaten 2 Vega Bars from my FitApproach and Vega Campaign, but they have been amazing! 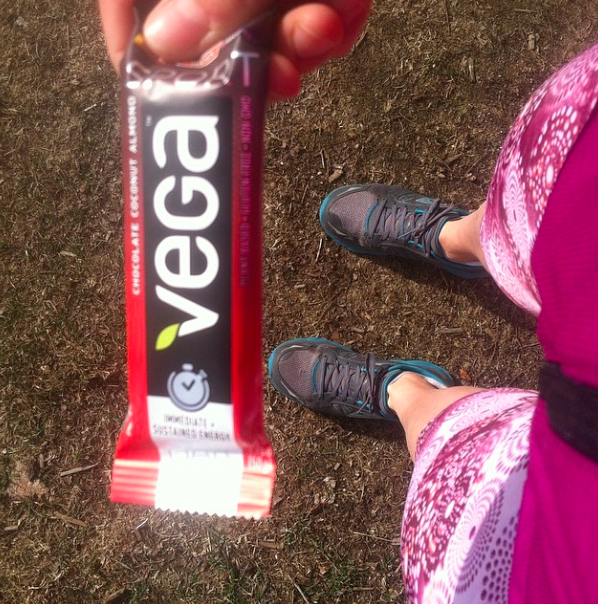 Yesterday I ate the Chocolate Coconut Vega Sport bar before my run. It tasted amazing and definitely gave me the energy I needed for my 7 mile run! 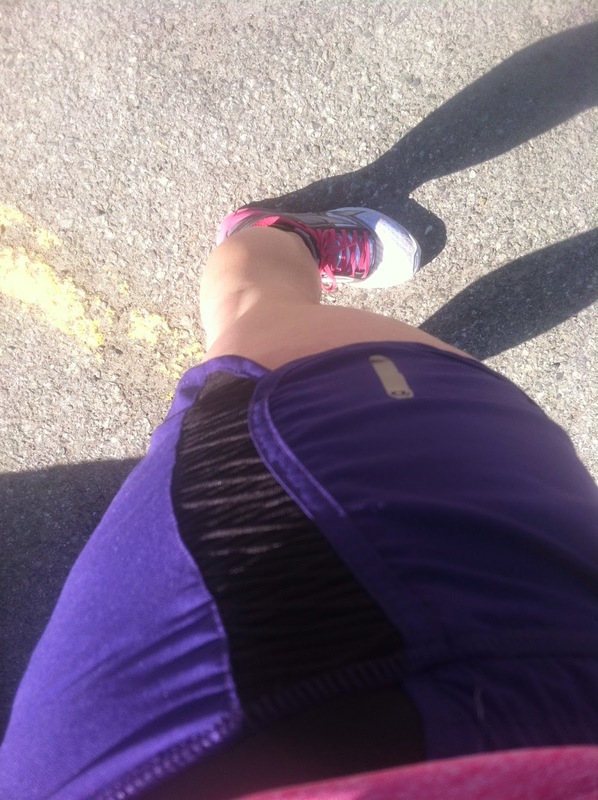 I have quite a bit of compression gear and each item has it's own purpose. 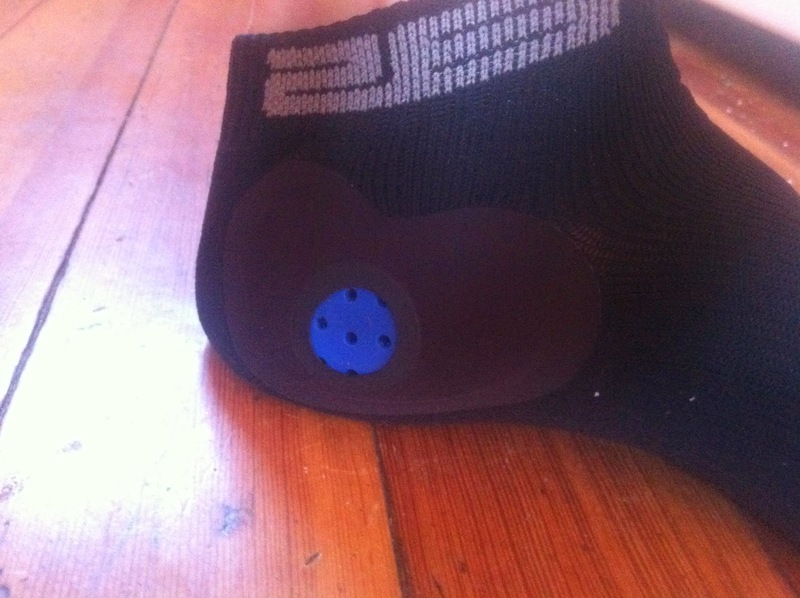 The newest addition to my compression addiction happens to be these Bio Skin calf sleeves. They are not like any other compression sleeve I've worn. They are much tighter than the others and do not seem as breathable. 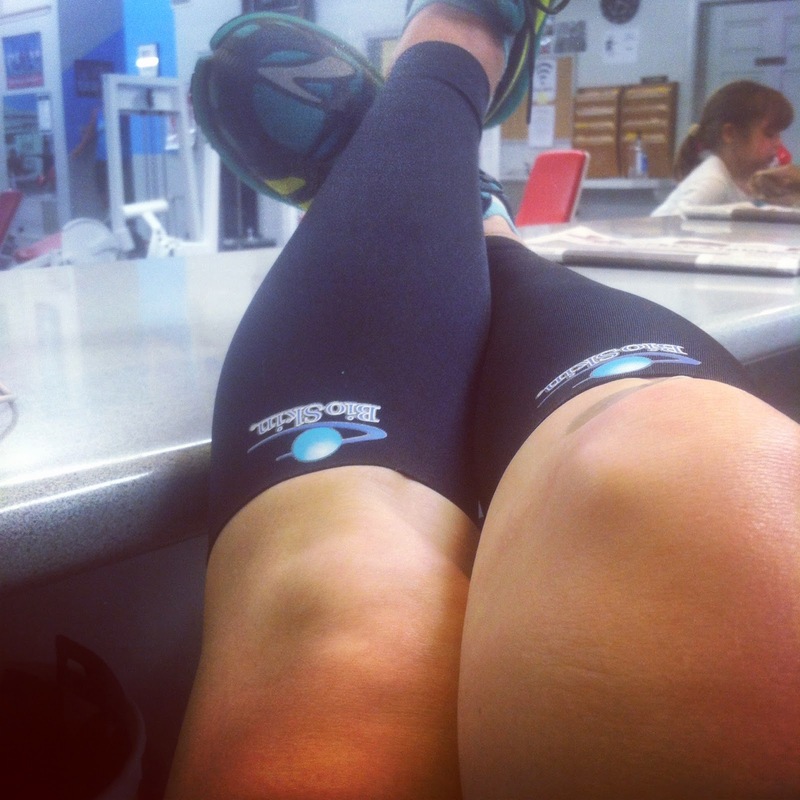 However, it only takes a short amount of time for my legs to feel awesome after I put them on following a long run. 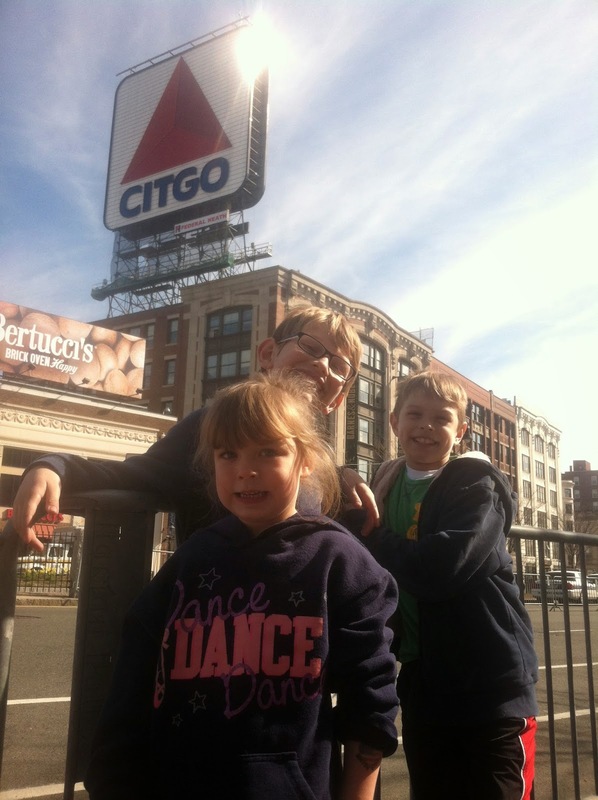 I have a full recap coming soon on the Boudreau trip to Boston. But it is definitely a favorite. This was our 3rd year heading down to watch Ward rock the race. This year we promised Ward we wouldn't cheer from the finish line area. Instead we chose to be at the 25 mile marker. Which was absolutely perfect! Soon, it will be my turn to be on the other side of the barricades running my own Boston. But maybe I should start training for and running marathons first. Give me a couple of years. I'll be ready to do it again! We have had a couple of gorgeous days. A couple. And I have been lucky enough to put on some shorts (with my super white legs) and get in some mileage. My favorite shorts have been the Pearl Izumi Flash short. Next week there will be a full review and a giveaway! You know when you are surprised by a product? This one shocked me. In a good way. I wasn't sure how that padding would feel in my shoes, but that little extra bit of padding holds my shoes in place, which means no slippage. I feel like I'm getting a more efficient run when I wear these! And you can get the chance to do so too! Check out my giveaway and enter for your chance. What are your favorites lately??? Those Spandits are adorable :) My new fave are my Altra Intuitions! Mmmm those vega bars look yummy. I'm loving our warmer weather but not the humidity. And I am so incredibly over wind! I just had the chocolate coconut vega bar after my run. I don't like coconut all that much but it was delish! My favorite lately.. is the weather. It has been so nice out I spend every minute outside I can and am not getting any housework done. But seriously this week the weather has been so perfect. Well it is raining now so I might get something done today. I do love rain too, makes it all smell so good.